Students come to this activity familiar with the basic assumptions of plate tectonics. Using a Google Earth platform showing commonly accepted lithospheric plate boundaries as well as locations of GPS stations, students form a hypothesis about motions expected across a particular boundary. They then set about testing their hypotheses by plotting motion vectors using two independent methods. METHOD 1: LONG-TERM "MODEL" RATES OF PLATE MOTION Students use a "Plate Motion Calculator" to determine "model" rates of plate motion averaged over millions of years. METHOD 2: GPS MEASUREMENTS INTERPRETED IN TERMS OF PLATE MOTION Students interpret GPS data as near real-time rates of plate motion. 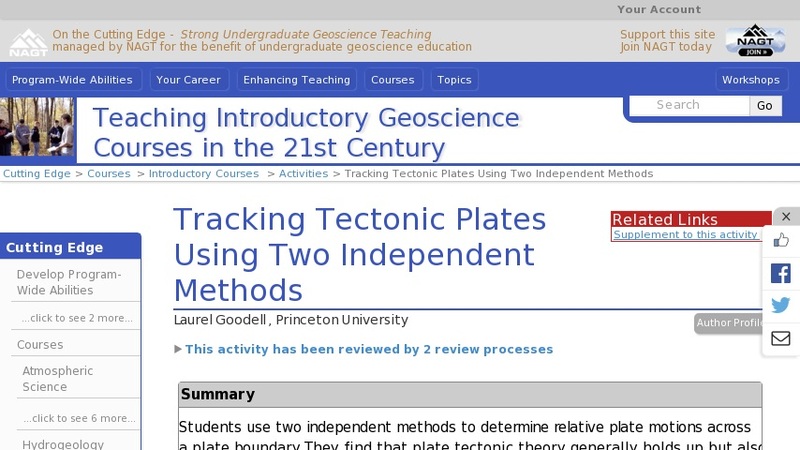 RESULTS Students find that in general, plate tectonic theory holds up. However, they also discover sophisticated detail rates are not constant, internal deformation of plates does occur and some boundaries are "wider" than others. Student evaluations of the activity demonstrate that they feel engaged and empowered as they work with authentic data, and gain a sophisticated understanding of a fundamental theory as well as the process of doing science.